3 Goldfinches species in North America: American, Lesser and Lawrence’s Goldfinch. 4 miles the distance that flocks of American Goldfinch roam between feeding stations in a single day. 3 to 2 male to female ratio in the population of American Goldfinch. This imbalanced ratio may be due to the fact that male goldfinch live longer than their female counterparts. 4 - 10 feet high that goldfinches typically place their nest. 5 eggs in a typical goldfinch brood. 12 days goldfinch eggs are incubated and another 12 days to leave the nest. 3 weeks that young American Goldfinch are dependent on their parents after fledging. Information provided by WBU, Inc.
Molting is the process by which a bird replaces its feathers. When a bird replaces all of the feathers on its body, it is described as a full molt. A partial molt may occur between full molts for some species of birds as they replace only a portion of their feathers. An example of a partial molt is when American Goldfinch obtain their bright breeding plumage by replacing only their body feathers each spring. Their body plumage, flight and tail feathers are all replaced during a full molt each fall. Most backyard feeder birds molt from July-September. Some molt through October like Downy Woodpeckers, Mourning Doves and Eastern Bluebirds. American and Lesser Goldfinches can molt through December. Typically, birds molt feathers in regular patterns or on specific parts of their bodies, and it may take weeks or months for birds to complete the molting cycle. Coastal Lesser Goldfinches perform a full molt in the fall and some perform a body molt in the spring. Interior Lesser Goldfinches perform a full molt twice a year: spring and fall. Protein is essential for growing strong feathers. Every molting bird needs extra proteins to grow strong feathers for proper flight and effective insulation. Fats are essential for feather coloration. Birds need extra fats for energy to grow feathers and provide proper coloration to best attract a mate. Feathers are over 90% protein, primarily keratins. A bird’s feathers contain 25% of the total protein found within its entire body. It takes extra energy to grow feathers and also the right building blocks to grow them. The main ingredients in growing feathers are amino acids (protein) and lipids (fats). Birds will eat more of their daily diet and/or seek out foods high in protein and fat to satisfy both the extra energy requirements and the needed building blocks. Lipids are substances such as a fat, oil or wax (usually from tree fruits). Dietary lipids supply energy, essential fatty acids and pigments for birds. Like pigment dyes are used to color our clothes, colors in feathers come from different pigments found in lipids. Blue and white colors = Not created by pigments but by reflections of light off the structural elements of a feather. In many bird species, carotenoids are required for breeding success...poorly colored birds are less likely to breed. Carotenoids help communicate reproductive fitness to prospective mates by providing a vibrant and bright plumage...a sign of being successful at obtaining both a sufficient quality and quantity of food. The more color and more brightly colored a male House Finch the greater the likelihood of attracting a mate. A male Red-winged Blackbird’s dominance depends on his bright red shoulder epaulettes being bigger than another male’s. The larger the red epaulet patch, the better he can defend a territory and attract multiple mates. A diet low in proteins and fats may cause feathers to be improperly colored or form defectively such as being frayed or curved. If their colors are duller birds may have trouble attracting a mate. If the feathers are defective, it could seriously hinder their flying or insulation abilities. Material provided by WBU, Inc. All images by Nancy Castillo. 2 eggs are generally laid in a hummingbird nest. 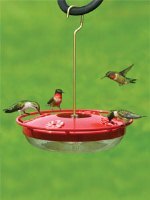 2 times their body weight is the amount of nectar hummingbirds will drink every day (most birds only eat ¼ - ½ their body weight). 12 times per second that a hummingbird tongue can move in and out while lapping up nectar. 80 times per SECOND is how fast hummingbird wings can beat! 50 beats per minute that a Ruby-throated Hummingbird heart will slow down to during periods of energy-saving torpor. It usually beats 1,200 times per minute! 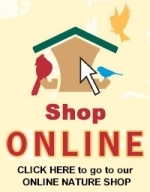 A bird's primary consideration when choosing a nesting site is security. Protection from predators and proximity to food is of vital importance to the success of a bird's offspring. You increase the chance of a Black-capped Chickadees using a nestbox when it has a few inches of wood chips on the bottom of the box. The one-foot-long hanging nest of a Bushtit resembles an Oriole’s nest and is woven out of a variety of materials including mosses, lichens, leaves and spider's webs. The nest of the Ruby-throated Hummingbird is about the size of a walnut and is camouflaged with lichen, making them very difficult to locate. Chimney Swifts build their nest in chimneys, tree cavities and on walls by gluing twigs together with their sticky saliva. Male Red-bellied Woodpeckers may start excavating multiple cavities but the female chooses the one they'll use. Eastern Phoebes may use the same nest site repeatedly, sometimes building right on top of the old nest. Chipping Sparrows line their nests with animal hair, preferably horse hair. Tree Swallows line their nests with light-colored feathers. The Rose-breasted Grosbeak nest is so flimsy the eggs might be visible from below. American Crows do not breed until they are between two to four years old and they often stay with their parents and help them raise the young of following years. Family groups may include over a dozen individuals from five different years. Tufted Titmice often line their nest with animal hair. They have been known to pluck those hairs from live animals or even from humans! Tufted Titmouse gathering human hair. Photo provided by WBU customer Susan B. The Cactus Wren builds an elaborate gourd-shaped nest in about ten days, and may fuss with improvements for another several weeks. The Great Crested Flycatcher nests in a cavity and will usually include a piece of snakeskin in its lining. Male House Wrens will start multiple nests, letting the female choose the best nest to use for their brood. Bald Eagles have faced many perils since the 20th century, mostly due to human interactions. Though they have been on the 'endangered species' list, moved to the 'threatened' list and have been recovering well with breeding pair introductions in many states, they still have a long way to go to reach their previously estimated population sizes. The Bald Eagle lives throughout a large part of North America, primarily in the US and Canada, and is usually found near rivers and bodies of water. Bald Eagles are opportunistic feeders and usually prefer to eat fresh fish. During winter, they will eat more birds, mammals and carrion. Bald Eagles usually hunt from a high perch and glide down to catch their prey. They will strike from the air and are known to wade into shallow streams or rivers for fish. Bald Eagles are occasionally pulled into the water while trying to catch large fish. These birds are surprising good swimmers, using their wings to mimic a motion that is similar to the butterfly stroke.# Bald Eagles first breed at about 4-5 years of age. Bald Eagle nests are massive and can take months to build. They usually measure about 5 feet wide and 3 feet tall and are made of sticks and branches. Nests may be reused and added to for years. The biggest recorded Bald Eagle nest was about 9 feet wide and 18 feet tall. Nests are typically found in a very tall tree, up to 180 feet or more above the ground. Bald Eagles usually lay two eggs. Male Bald Eagles help the females incubate the eggs, and both care for the young after they hatch. Both parents are very careful around the eggs while in the nest. They will even clench their toes to possibly prevent the eggs from being punctured by their talons. Babies hatch in about 35 to 46 days and will leave the nest in 10 to 11 weeks. However, they will still be fed for a month after fledging. Juvenile Bald Eagles gradually spend time on their own away from their parents and learn to hunt by trial and error. They may eat a lot of carrion, especially fish, till they master hunting live food. Immature Bald Eagles have been known to explore vast areas for multiple years. Some Floridian young have been seen in Michigan, and some Californian young have gone as far north as Alaska. Bald Eagles can stand up to 3 feet tall and have an average wingspan of 7 to 8 feet. They can weigh over 9 pounds. Check out the Cornell Lab of Ornithology site All About Birds to read more about our national bird, the Bald Eagle. Hear their unusual voice, read about their behavior, view their range and more. Share these cool fun facts with the children in your life. and see how it compares to the Bald Eagle's wingspan? The Downy Woodpecker gets this award. Though they share daytime nest duties with mom only the dads incubate and brood at night and roost in the nest until the offspring fledge. Chickadee and nuthatch dads feed mom while she incubates and broods the eggs. Dad also helps feed the young once they have hatched. Downy Woodpecker and American Goldfinch dads like to take the family out to eat. When the young fledge from the nest, dad leads them to top food sources and teaches them how to use his favorite backyard bird feeders. Ladies love a sharply-dressed man, even in the bird world. Only the most colorful and well-groomed House Finch and goldfinch males are preferred. Carotenoids, a pigment found in foods that create bright feathers, help a potential dad communicate his reproductive fitness via his plumage. The White-breasted Nuthatch male gets a special protection detail. His mate protects him from trouble and is a “watchdog,” leaving him more time to concentrate on hunting for food. She rarely strays far from him and stays in constant vocal contact. Pygmy and Brown-headed Nuthatches provide future dads with on-the-job training. A third of all breeding pairs of Pygmy Nuthatches have 1-3 male helpers. 20-60% of all breeding Brown-headed Nuthatch pairs have at least one helper. They assist in feeding incubating females, nestlings and young fledglings. Dads dig tools. Nuthatches are one of the few species of birds known to use “tools.” The White-breasted Nuthatch has been known to use stinky beetles as a tool by crushing and then sweeping them in and around their nest site to deter squirrels from their eggs and young. The Brown-headed Nuthatch will take a flake of pine bark in its bill and use it to pry up bark in search of prey. Adult male Song Sparrows love to perform. They sing 6-20 different melodies every eight seconds and average over 2,300 songs a day. The larger their repertoire of songs, the more successful they are in attracting a mate and in holding their territories. Mourning Dove dads love to raise families. They may have up to six clutches per year, usually with two eggs per clutch. This is the most of any North American bird, most likely due to the fact that the average life span for an adult Mourning Dove is 1½ years. The male Northern Cardinal 'kisses' his mate during courtship. He feeds her seeds while courting her and it appears they are kissing each other. The Dark-eyed Junco is currently divided into six distinct populations that include the following: Oregon, Pink-sided, White-winged, Slate-colored, Gray-headed, and Red-backed Juncos. There are an additional 12 subspecies divided among these populations. The Dark-eyed Junco has been documented to produce hybrids with White-throated Sparrows. Dark-eyed Juncos tend to return to the same area each winter. Chances are that you have many of the same birds at your feeder this winter that you had in previous years. Visiting flocks of juncos will usually stay within an area of about ten acres during their entire winter stay. To avoid the competition, many female juncos migrate earlier and go farther south than most of the males. In Michigan only 20% of the wintering juncos are females, whereas in Alabama 72% were found to be female. Male juncos tend to spend the winter farther north in order to shorten their spring migration and thus gain the advantage of arriving first at prime breeding territories. When migrating, female juncos move south before the males do, and adult females leave before the young females. Juncos migrate at night at very low altitudes and are susceptible to collisions with communication towers and other structures. Each winter flock of juncos has a dominance hierarchy with adult males at the top, then juvenile males, adult females and young females at the bottom. You can observe the pecking order with birds lunging at subordinates or even pumping the tail or flashing the white outer tail feathers.. While almost all Slate-colored Juncos in the eastern portion of North America migrate, a population of juncos in the Appalachian Mountains is residential, remaining in the same area year-round. While the southward migration of Slate-colored Juncos is complete by early December, there is some evidence that indicates that harsh winter weather may spur some juncos to move further south at anytime during the winter. Juncos have over 30% more feathers (by weight) in the winter than they do in summer. Juncos prefer to roost in evergreens at night but will also use tall grasses and brush piles. They return to the same roost location repeatedly and will share it with other flock mates, but they do not huddle together. The name junco is derived from the Latin word for the “rush” plant found in wetlands. Partners in Flight currently estimates the North American population of Dark-eyed Juncos at approximately 260 million, second only to the American Robin in overall population size in North America. A separate research paper estimates that the junco population could actually be as high as 630 million. According to Project FeederWatch, juncos are sighted at more feeding areas across North America than any other bird. Over 80% of those responding report juncos at their feeders. A study in New Hampshire on the foraging habitats of the Slate-colored Juncos found that they spent over 65% their time on the ground, 20% in shrubs, 16% in saplings or low trees. They were never observed in the canopy of large trees. Juncos, along with some other members of the sparrow family, practice an interesting foraging method called “riding.” They fly up to a seed cluster on the top of a grass stem and “ride” it to the ground where they pick off the seeds while standing on it. Juncos are known to burrow through snow in search of seeds that have been covered over. On an annual basis, a junco’s diet is made up of approximately three parts seeds to one part insects. During the nesting period, the percent of insects can increase up to 50-60% of their diet. You may not like these weeds in your yard, but the seeds of chickweed, ragweed, knotweed, pigweed, lamb’s quarters and crabgrass are some of the main natural seed sources used by juncos. You can attract juncos to your yard by feeding a seed blend containing millet and hulled sunflower seeds. Male juncos return and reclaim the same breeding territory year after year. Juncos typically have two broods per year with the female building her nest on or near the ground and laying three to five eggs. The male does not incubate the eggs but does deliver food to the young and helps the female to defend against predators. The young leave the nest in 9-12 days. Studies have shown that Dark-eyed Junco’s nests are the victim of predators between 20-80% of the time. Rodents such as chipmunks and deer mice are probably the major predators on the eggs of juncos. Check out Wild Birds Unlimited rightbird Online Field Guide to read more about Dark-eyed Juncos. Hear their voice, read about their behavior, view their ranges and more. Share these cool fun facts with the children in your life. Broadcast a blend with lots of millet for juncos. And when there's 1 junco, there's usually more! Woodpeckers may find their hidden prey by sound and/or smell. When feeding on wood, grubs make an audible sound that could be heard by a woodpecker. During cold winter weather, tree-foraging birds such as woodpeckers do not increase their body fat as much as ground-foraging birds, probably due to the fact that they roost in cavities overnight and that snowfall rarely hampers their ability to find food in trees as compared with birds searching for it on the ground. Most species of woodpeckers are born completely naked, unlike many other birds that are completely covered with soft down feathers when they hatch. To help distinguish the difference between a Hairy and a Downy Woodpecker visiting your feeders, look for the Hairy’s chisel-like bill which is much longer than the Downy, which often equals the width of the rest of the head. The Downy’s head is twice as wide as its very short bill. The smallest North American woodpecker is the Downy Woodpecker at 6" in length. The Downy Woodpecker was first formally described by the Swedish biologist, Carolus Linnaeus in 1766. In winter, small birds tend to lose heat faster than larger birds due to the ratio of surface area to weight. As a result, Downy Woodpeckers in Alaska are about 12 percent larger than they are in Florida. The feather pattern on the back of head of Downy Woodpeckers is unique to every bird and downies may use them to recognize other individual downies. Scientific tests have determined that Downy Woodpeckers do actually use the presence or absence of the red patch on the back of other downies head to determine whether they are male of female. Male Downy Woodpeckers are dominate over female downies and select the best feeding sites for their own use and defend them against the females. Female Downy Woodpeckers have slightly longer tails than do the males. This may be explained by the fact that they spend more time foraging on vertical surfaces, such as tree trunks, and thus use their tail as a brace more often than their male counterparts, which spend most of their time foraging on smaller horizontal branches. Check out Wild Birds Unlimited rightbird Online Field Guide to read more about Downy Woodpeckers. Hear their call, read about their behavior, view their ranges and more. Share these cool fun facts with the children in your life. Downies are easy to attract to feeders with suet. This makes it easy for children to observe and enjoy! Tufted Titmice have an alarm call that seems to fade off into the distance, giving the impression that the bird is moving from one place to another. Birdwatchers and predators alike can be fooled into chasing this ghost call while the titmouse stays securely hidden out of sight. It eats with its feet! Tufted Titmice are one of just a few perching birds that can use their feet to hold seeds while they break them open. During the winter the Tufted Titmouse forages together with Chickadees, Nuthatches, Woodpeckers and Brown Creepers. The Tufted Titmouse is apparently totally dominant over the Black-capped Chickadees within their territory. Chickadee survival rates often plummet after Titmice expand into their territory for the first time. The Tufted Titmouse has been expanding its range northward since the 1940’s and is now found almost to the Canadian border across most of its range. Speculation for the expansion includes warming winter temperatures, the increase in mature woodland habitat, and increase in winter birdfeeding. Read more about its expansion throughout New York state. Young Tufted Titmice often remain with their parents throughout their first winter. On rare occasions, a young Tufted Titmouse will stay with its parents into the nest nesting season and help its parents raise the next brood. Talk about being camouflaged! A wintering Tufted Titmouse perched among the gray branches and brown dead leaves of an American Beech tree seems to disappear completely. The Tufted Titmouse and the Black-crested Titmouse were re-classified into just one species in 1983. The Black-crested Titmouse frequents mesquite shrub habitat and the Tufted Titmouse favors broadleaf hardwood forests. Tufted Titmice always chose the largest sunflower seeds available to them. Tufted Titmice typically select one seed from a feeder at a time. They shell it and hide the kernel within 130 feet of the feeder from which they obtained it. Tufted Titmice typically cache seeds under loose bark (46% of cases), but they also used furrows cracks, along with broken and rotted areas of trees, as well as on the ground. Tufted Titmice will regularly eat snow when water for drinking is not available. Tufted Titmice often give a high-pitched alarm call in response to a hawk flying overhead. Tufted Titmice do not excavate their own nesting cavity. Instead they use natural holes in trees and abandoned cavities excavated by Downy, Hairy, Red-bellied, Red-headed, and Pileated Woodpeckers, and by the Northern Flicker. They will also use artificial nesting boxes. Titmice will readily utilize nesting material such as alpaca wool, sheep's wool and pet hair. Here's a link to some images of them gathering nesting material. The Bridled Titmouse, unlike the other titmice species, does not hide seeds for future use. The part of the brain used to store memories of hiding places is small in this species compared with other species that frequently hide food. The Bridled Titmouse is the only species of its family in North America that appears to have regular helpers, in addition to its mate, when nesting. The Oak Titmouse mates for life, and together they defend a territory throughout the year. The incubating female of the Juniper Titmouse sits very tight on her nest and will hiss like a snake if disturbed. Check out Wild Birds Unlimited rightbird Online Field Guide to read more about the Tufted Titmouse and all the titmice. Hear their calls, read about their behavior, view their ranges and more. Share these cool fun facts with the children in your life. Titmice are easy to attract to nearby feeders for kids to observe and enjoy. Sharpie in the Yard! Sharpie in the Yard! We've had an immature Sharp-shinned Hawk "shopping" in the yard recently. He's still learning the ropes it seems, as he's still a little clumsy in his hunting technique, his stealthiness, and his landings. He's been following smaller birds through somewhat dense trees and bushes. Witnessing that helps me understand why studies of woodland hawks show that almost 1/4 of them had healed fractures in the bones of their chest. Telling sharpies apart from Cooper's Hawks can be a challenge, but one of the characteristics I look for is the thickness of their legs: Sharp-shinned Hawk legs are skinnier than the Coopers. Those skinny legs show up well in the photo above. Telling immature from adult is easier, with the immature showing VERTICAL brown breast streaking versus the adult's HORIZONTAL orangish breast streaking. And if you're lucky, you'll see the immature's iris as somewhat yellowish versus the adult's deep red iris. To survive, a Sharp-shinned Hawk needs to capture and eat one bird per day on average. The immature bird made two trips through my yard yesterday morning, both unsuccessful, but when he failed to return later in the day, I thought perhaps he had caught his bird du jour. Read all our Fun Facts about Sharp-shinned and Cooper's Hawks in my Wild Birds Unlimited Bird of the Month post.